Momordica balsamina is commonly referred to as Balsam Apple. The perennial climbing plant have stems 5cm long that develop from a tuberous perennial rootstock. The stems use tendrils to climb other plants or spread over the ground surface. The tropical plant is used for traditional medicinal purposes, or as a vegetable plant. This plant is found in the wild or sometimes grown in small farms. Momordica basamins has tendril vines, grows in tropical and subtropical regions. It is an invasive plant native to Africa and introduced to Central America, Asia and Australia. 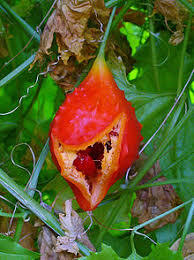 Related to Momordica charantia it is known by many names as balsam pear, balsam apple or cacana, nkaka. It has round, deeply veined pale yellow flowers. The immature fruits are green and mature fruits are warty bright orange. When ripe the fruits burst revealing many seeds covered in a bright scarlet sticky coating. The bark, seeds, fruit, leaves contains glycosides, steroids, flavonoids, alkaloids. Other constituents are resins, trepenes, saponins. Common in traditional medicine based on its anti-bacterial, anti-inflammatory, anti-septic nature. The leaves has 17amino acids, with high potassium content. It is consumed as a vegetable when properly processing. The leaves are cooked as vegetable in sauces or soups. The fruits are oblong shaped harvested when green and immature. The immature green fruits are handpicked and soaked for an extended period before they are used in soup or cooked. The ripe fruit is poisonous and linked to diarrhea and vomiting. The seeds and outer rind of the fruit are also poisonous. Warning: only people with experience in processing the leaves and immature fruits should use this plant because it is poisonous. Traditional medicine practitioners use the plant as a purgative, wound healing or to treat urinary infection. They develop concoctions to treat skin disorders, rheumatism or anthelmintic issues. The efficacy of their traditional medicine are unsubstantiated because they are not put to scientific tests. The plant forms a slightly soapy solution in water and used to wash handy or body. Other uses of the fruits are as a soap substitute, leaf sap to clean metal. The plant is wide spread in the tropics and common to Australia and Africa. The preferred habitat are forest areas, coastal dune forest. Other locations include semi- shaded areas, savannahs and grassland areas. The edible rating is poor and plant is poisons. The habitat perennial wild plant, grows 5m high few cultivars. The medical applications are also not substantiated. The plan grows in warm temperate regions with abundant sunlight. However it requires shade and found in areas with sea level 1,465 meters. They also grow in areas with rainfall of 250 to 1,200mm annually. The plant is found in subtropical demography is frost hardy, germinates in different soil compositions. Soil compositions include calcareous soil, gravelly soil. Others are clay, loamy clay and sandy soil. The addition of organic matter will enhance the growth and performance. It is propagated by sowing the seeds.